Collective cell migration, in which groups of cells move together with a common purpose, is important for processes ranging from wound healing to tumor metastasis. Migrating cells respond to a combination of physical cues elicited by cell-to-cell contact and waves of chemical signals sent out by local cells to attract others to their location. Hidenori Hashimura, lead author of the study, explained how they used changes in the intensity of chemical signals to deduce the importance of this type of signalling at different developmental stages. "Cyclic adenosine 3ʹ,5ʹ-monophosphate (cAMP) is the only chemical guidance cue for cell aggregation. 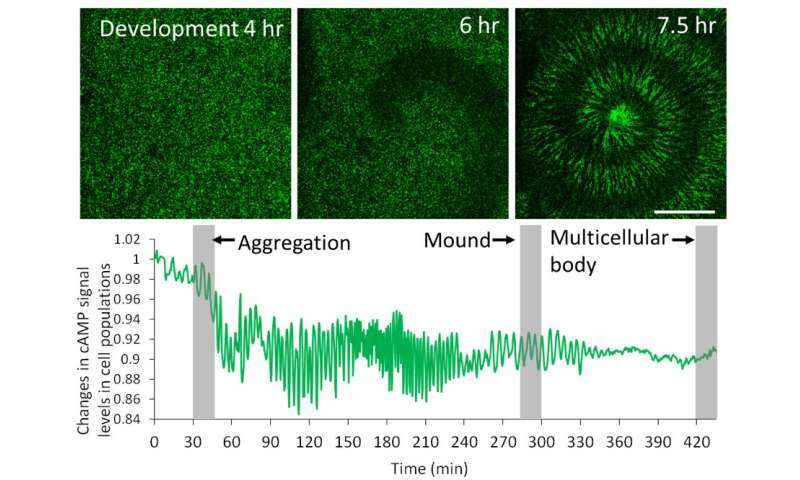 Using live cell imaging, we clearly observed waves of cAMP, which can be visualized using a green fluorescent probe, during the initial stages of cell aggregation," says corresponding author Yusuke V. Morimoto. 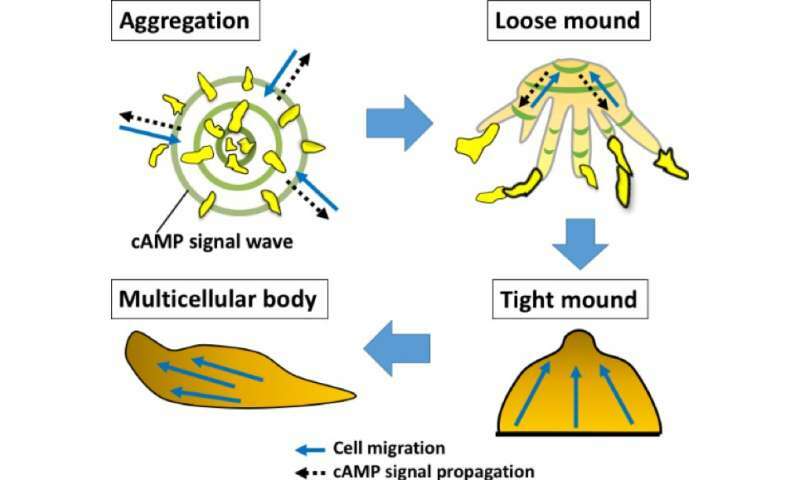 However, it was revealed that the cAMP signals gradually disappeared during migration of the multicellular slugs. The researchers proposed that "contact following," where physical contact between cells allows them to follow each other, is likely to be responsible for collective cell migration during the slug phase of Dictyostelium development.